When things don’t go our way, it is seductive to blame people, circumstances and events — to get stuck in the regrets and disappointments. Most of us could benefit from looking back on hard times and asking ourselves how we can best reframe those experiences through a more accurate, appreciative, and positive lens. Remember that some gifts come wrapped in the most unlikely packages. Sometimes people get stuck in the victim role and can’t move ahead. You may have heard the acronym FEAR, which maps to False Evidence Appearing Real. Often the stories we have internalized are not based on our reality, but on someone else’s distortion. 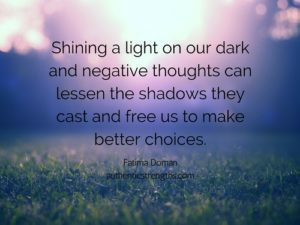 Choosing a new, more accurate story to tell yourself, stepping back and allowing powerful new questions and gratitude to enter into the process, defuses the victim mentality. Some of the world’s greatest thinkers and leaders were told that they would never amount to anything or were labeled due to disabilities. Sir Richard Branson, founder of more than 100 companies in his Virgin empire and one of the world’s great philanthropists has dyslexia and performed poorly in school. He was criticized by his headmaster and eventually dropped out of school at age sixteen. Both Thomas Edison, who still holds more patents than anyone, and Albert Einstein were allegedly kicked out of school and homeschooled by their mothers. 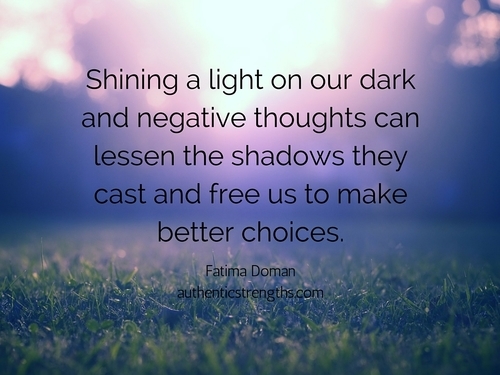 Shining a light on our dark and negative thoughts can lessen the shadows they cast and free us to make better choices. Often, it can be as simple as crossing to the sunny side of a street. Sometimes experiences we perceive as failures are opportunities that signal that our ego is in the driver’s seat rather than our authentic self. Our failures can be the turning points in our lives, revealing what our true purpose is.